A whole range of skillion carports are available for you and you property. These are all designed and engineered to all weather and wind conditions, not just around the Gold Coast and Brisbane areas, but around Australia. Minimum 75mm, 89mm and 100mm SHS posts utilised so you know your carport is properly supported and will stand up in storms etc. Hi-Tensile frames and sheeting used – quality materials, manufactured to last. 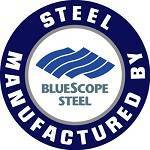 We only use and recommend genuine Colorbond steel and structural steel from Bluescope Lysaght. You get the best carport for your budget and you get a carport that has been solidly designed in steel to outlast other carports. Q.Is the skillion carport the easiest to install put up? A. Yes out of all the carport designs, the skillion carport design is the simplest. The frames and roof are cut to size with only final finishing work needed for the gutter and flashings. On the topic of flashings, the carport come with the right flashings so that it looks properly finished. Q. Does the carport come with everything? A. Yes the carport come with every steel part you need to build it. Apart from the concrete for the footing, you will only need some silicone to do a final seal on the guttering. Q. Do I get engineering with my skillion carport? A. Yes every carport we do will come with site specific engineering. In other words the carport is designed to comply with your specific address. This enable you to seek council approval. Q. Does the skillion carport come with longer posts to go into the ground, or do we bolt it to existing concrete? A. You have the option of either (except for oversize carports). We always prefer to see that the posts get concreted into the ground as this is better for several reasons. However footing plates can be supplied to fix to top of concrete. Note: adequate concrete/footings are required for fixing footing plates. If you are wanting a quality skillion carport, feel free to call us on 07 5525 1111 or send us an email at sales@esb.com.au . You can also go the carport quote page and simply fill out the short form and submit it. We’ll get back to you as soon as possible.